One of the exceptional tipid combo promo that consists of unlimited text to all network and unlimited facebook access. 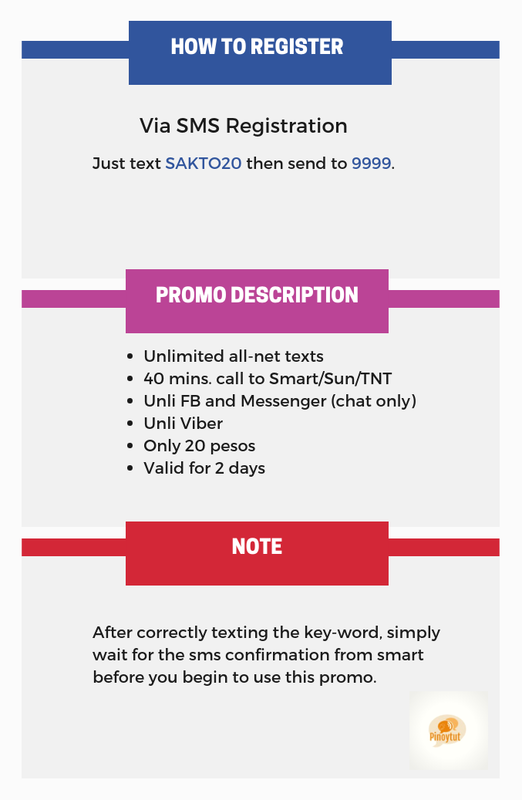 You could enjoy limitless texts to all networks, forty (40) mins trinet calls (SMART/TNT/SUN), unlimited Facebook and Viber for just only 20 pesos. For the validity, you do not want to worry, as this offer is valid for two days inclusive of Facebook and Viber application. Just text SAKTO20 then send to 9999. After correctly texting the key-word, simply wait for the sms confirmation from smart before you begin to use this promo.